Here I am! 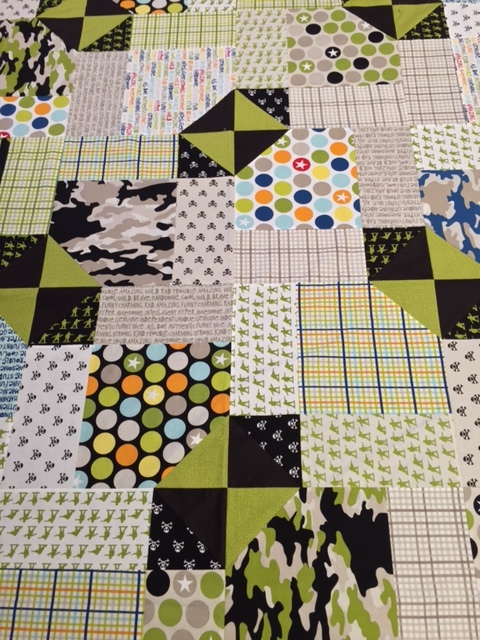 Back again after a long break… Last time I checked in, I was going to put the borders on my son’s newest quilt top… Minecraft Mayhem. And got started on it with some pressing, starching and sorting. 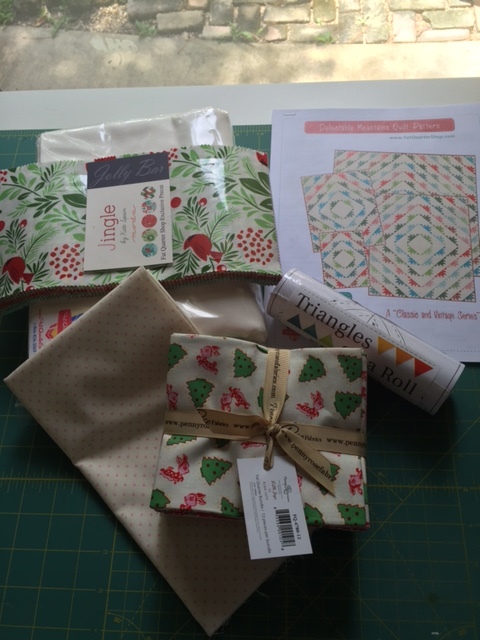 I wanted to add in some blues from the Jingle collection to join with the Little Joys fabric bundle. And since the Jolly Bar was going to take some extra thought and planning and a bit of a scrappy combination – I started with those. 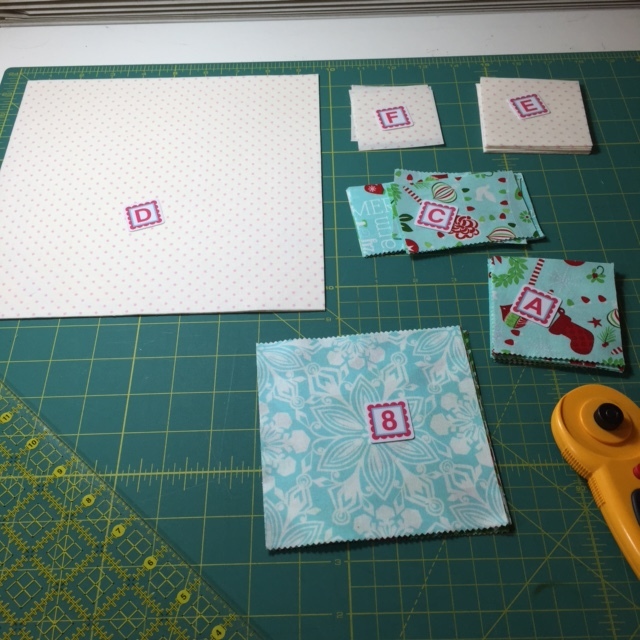 I wouldn’t be able to utilize the fancy Triangle Paper, so I was prepping for the old fashioned method (A squares). “8” is my substitute for my lost “B” alphabitty. 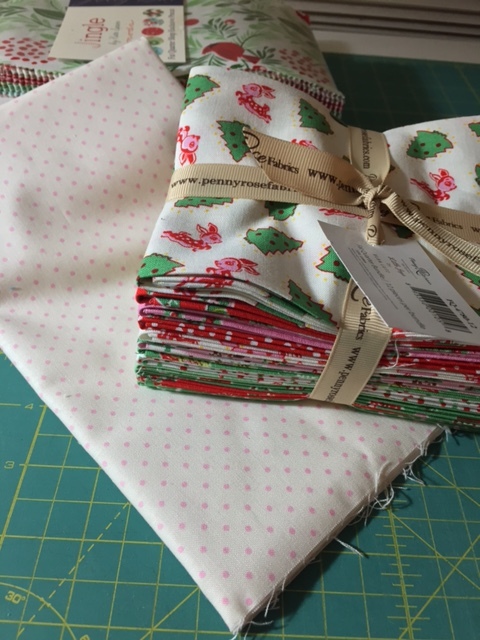 I’m really enjoying this new project – but to tell you the truth – there isn’t much wiggle room after you trim down the mountain unit to get the quarter inch allowance. 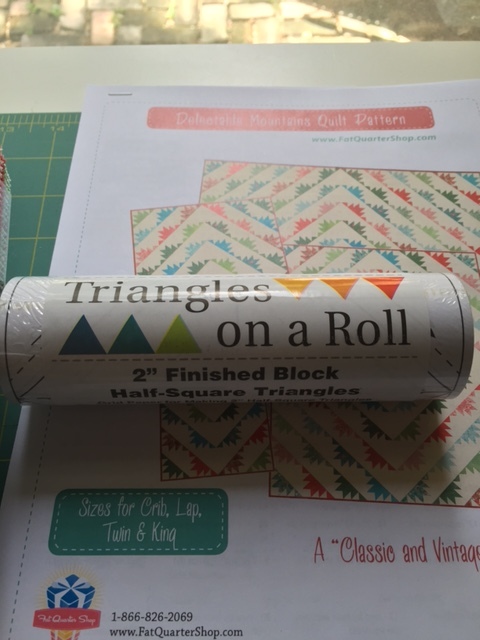 The FQS tutorial online makes it sound like you will have more to trim, but I find that I don’t. I also found that my mountain unit can in no way match to the same size as the background “B” piece that gets cut diagonally once. The FQS tutorial makes it look like they do come out approximately the same size, but they do not. 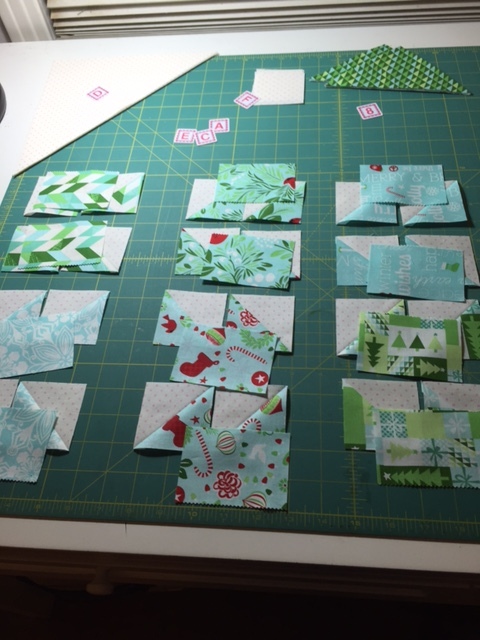 When Kimberly is pinning them together, she is matching up the two ends. I have a consistent 1/2 inch difference in length along those long bias ends. Or I am doing something wrong. I also couldn’t jump at the chance to buy these beauties off eBay last week. I have no good reason to get them this early because I won’t be doing a project with them anytime soon – but I really wanted to have them in person to touch and see. Hello patient follower! I think this is the longest gap I have had since I started blogging back in the summer of 2012. All kinds of boring stuff is going on here, because I have to go to work to make a living and afford my fabric indulgences. Lots of work. Too much work. 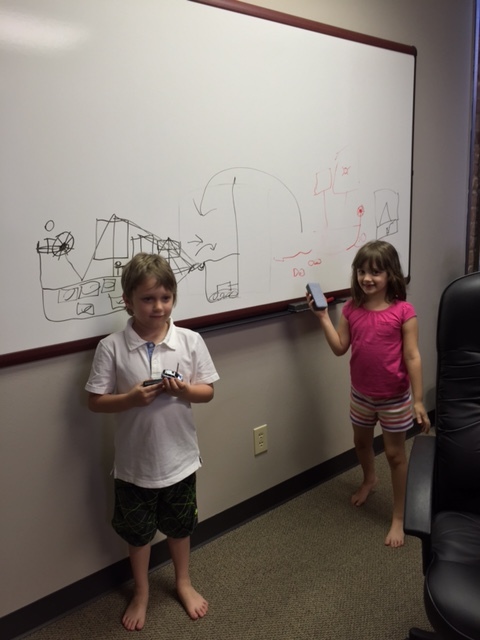 Which is a good thing for the success of our company, but also puts a lot of pressure on everyone to keep up. 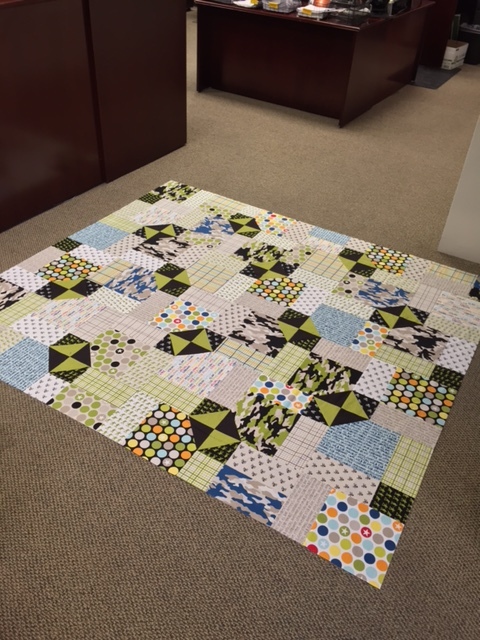 While I was at the office, I brought in my latest quilt top that I was making for Oliver. 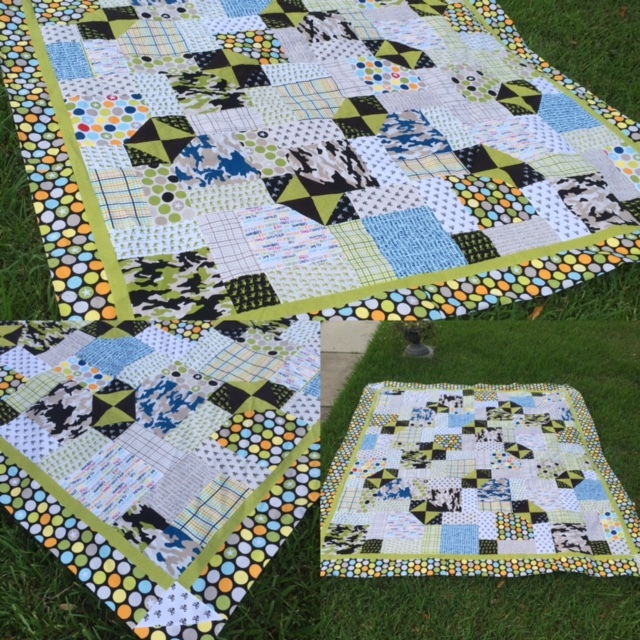 Something big enough to really cover his queen size bed and tuck in at the ends and corners. I needed a large open space to lay it out so I could accurately measure the sides for cutting my borders. I think right now it was around 76 x 84. It kind of looks like a nuclear warning flag. I’ll post it again after I get the borders done. It will look a bit less chaotic. And huge. I think it could fit a king size bed. 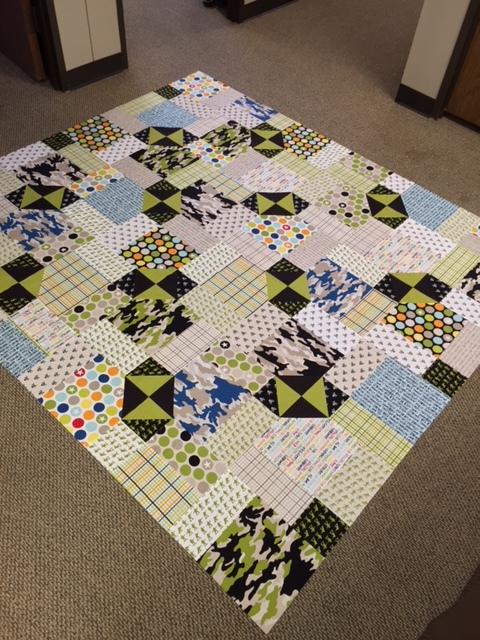 Finished size will be around 88 x 96. Once this is done – I’m super excited to cut into something new. 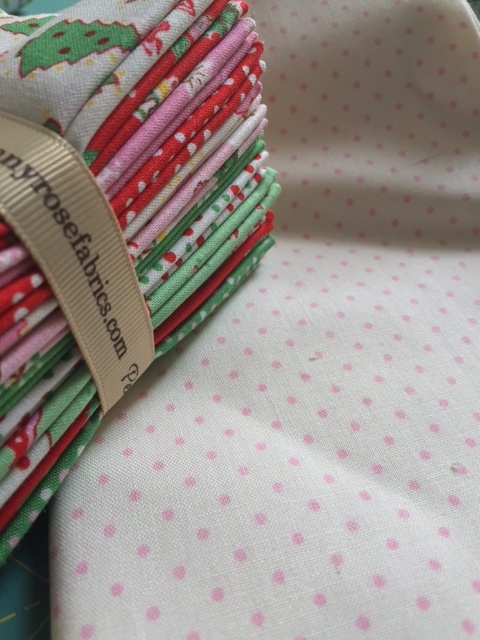 I really loved the collection “Little Joys” when I first spotted a preview of it on this post from Pretty by Hand. 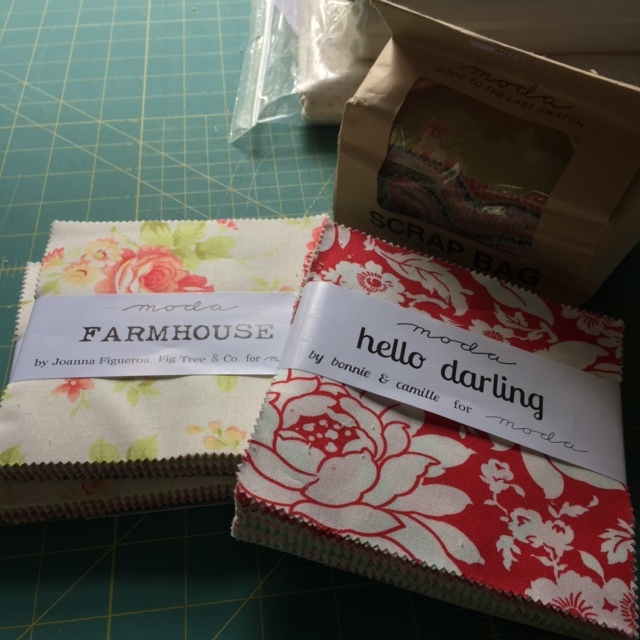 I’m waiting to see what Kristyne is going to do with her fabric. 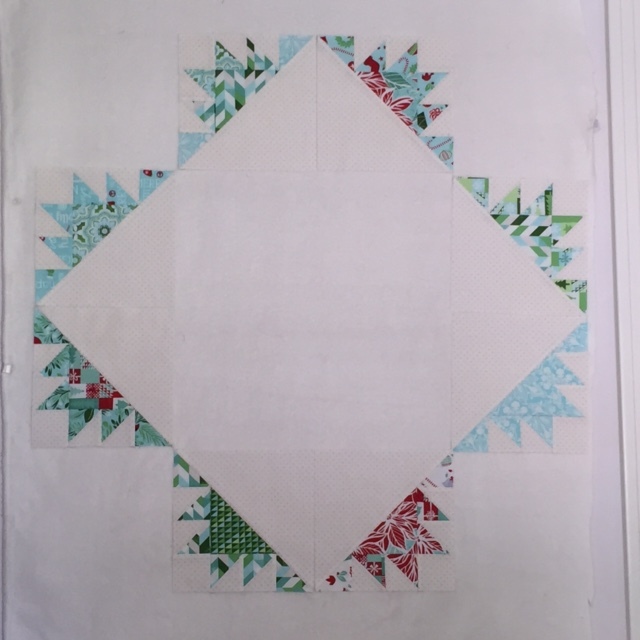 For me, I’m going to put it together in the “Classic and Vintage” Delectable Mountain pattern that was showcased recently by Fat Quarter Shop (they even have a YouTube tutorial). They used the BasicGrey collection Evergreen, but I think this will do great too! 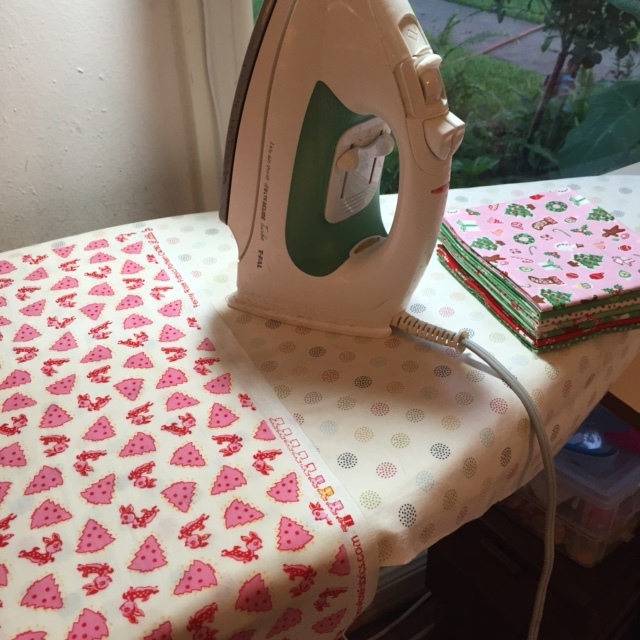 I took a chance and ordered some of the Le Creme Swiss Dots – Baby Pink on Cream Dots to coordinate with it for the background. 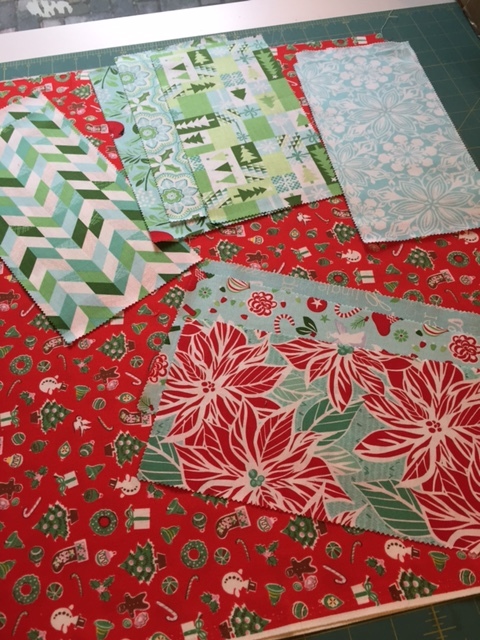 And a Jolly Bar of the new Jingle collection by Kate Spain to bring in some blues and make it a tiny bit scrappier. Planning on the lap size. So, if all goes well – likely to start on this project next week! 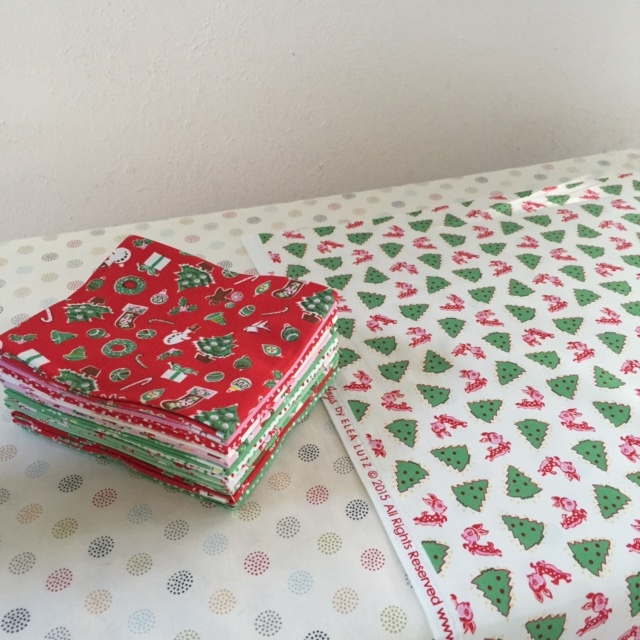 Do you have a Christmas in July project planned? I appreciate your input on that for those of you who are now experts in Instagram. I’m going to see about setting up the IG account under this website name instead of my own. Try to keep some sense of privacy, but who am I kidding. It’s all out there in the cloud, right?